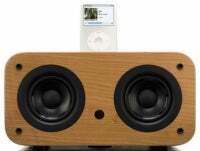 As the number of iPod speaker systems on the market increases, seemingly exponentially, some companies have attempted to stand out from the crowd by focusing on design and materials. Vers Audio is one such company, and the Vers 2x , its first offering, successfully employs such an approach. But it’s not just the wood cabinet that makes the 2x unique; it’s also the production process, which Vers claims strives to be environmentally-conscious at every step. For example, the system’s cabinet wood is harvested from “sustainable-managed plantation sources” via a process that uses every bit of each tree. Vers also uses screws instead of adhesives and plastic snaps, which is both better for the environment and makes the system easier to take apart and recycle at the end of its lifetime. All packaging, including the protective trays inside, is made from 100-percent recycled paper products that are, in turn, completely re-recyclable, and the company doesn’t use plastic or wire cable ties. Finally, the 2x’s amplifier is a Class-D switching model, which uses less energy than other types of amps, especially when the system is powered down. The 2x is also fully RoHS-compliant. As someone who sees far too much waste—plastic or other—each day while reviewing products, I applaud Vers Audio for this approach. The front of the 2x hosts two 3-inch speaker drivers, hidden behind a removable, fabric grill. On top is a silver-plastic iPod dock cradle that uses Apple’s Universal design and charges your iPod while docked. Seven silver-plastic dock inserts are included for compatibility with most dock-connector iPods; specifically, insert numbers 3, 5, 7, 8, 9, 10 and 11. There’s also an insert with a flat base for holding non-dockable iPods and other media players; you connect these via the included 15-inch audio cable. Just in front of the dock cradle, and also made of silver plastic, are a power button and a volume up/down rocker switch. The back and sides of the 2x are smooth pieces of wood, save two silver-plastic-encircled ports on the back panel to increase bass response. The bottom panel is made of black plastic and hosts, in a slightly-recessed well, the AC power jack, the aforementioned 1/8-inch auxiliary-input minijack, and a 1/8-inch audio-out minijack for playing the Vers 2x’s audio through another audio system. Although placing these jacks on the bottom of the system makes for a more-attractive appearance, it also adds a bit of inconvenience. Connecting the included audio cable to the auxiliary-input jack mutes all iPod audio, which means that if you want to use the Vers 2x for both your iPod and a second audio source (such as a computer or another portable device), you need to unplug the auxiliary cable whenever you want to listen to the iPod. But since the jack is on the bottom of the system, you have to turn the unit over to get to the jack (and remember to remove your iPod from the dock cradle first). A better solution would have been for Vers Audio to configure the 2x so that the auxiliary input and iPod audio were mixed together; that would also allow you to, for example, listen to your iPod while still being able to hear your computer’s alert sounds. Four rubber feet on the bottom of the 2x keep the unit from sliding around and also provide clearance for any cables to exit from underneath. The decision to use 3-inch drivers with no tweeters and no larger woofer(s) allows Vers to keep the 2x compact, but it also limits the Vers 2x’s audio capabilities. The system is midrange-heavy with no true bass, although decent upper-bass does give a sense of impact. Treble response is also missing a sense of higher-frequency detail; a number of other speakers at or below the Vers 2x’s price offer better performance in this area. On the other hand, the 2x, which houses a 15-Watt-per-channel amplifier, plays surprisingly loud for its size, and even at its loudest volume levels, I heard no distortion. Included with the Vers 2x is a large infrared remote control with a good array of functions. You get the usual—power, volume, mute, play/pause, back, and forward—but also buttons to toggle shuffle mode, skip to the previous or next playlist, and navigate your iPod’s onscreen menus. As much as I liked the design of the 2x itself, I wasn’t a fan of the remote. Made of silver plastic to match the 2x’s dock cradle, the remote’s buttons felt a bit cheap. I also experienced a frustrating issue with the remote’s performance. I often had to press a button several times before the command was recognized, even if the remote was only a foot or so away from the system. Other times the remote didn’t work at all. I replaced the battery and tried to use the remote from various angles, to no avail. Finally, I decided, just for kicks, to remove the 2x’s mesh grill. Bingo. The remote worked perfectly, with all functions recognized from 15 to 20 feet away. The grill was apparently interfering with the remote’s infrared signal. I contacted Vers Audio about this issue; the company said it was aware of the problem and has boosted the performance of the infrared system in currently-shipping models, although I wasn’t able to test this. Whether or not the Vers 2x will appeal to you depends largely on the relative values you place on design, environmentally-focused production, sound quality, and features. For a basic, desktop speaker system, the 2x is up there with the most attractive we’ve tested, is solidly (and sustainably) built, and sounds decent. However, at $180, you’re paying for that design and, presumably, for Vers Audio’s attention to the system's environmental impact (which, as I noted above, I wholeheartedly commend). Similarly, the 2x’s features and sound quality are limited compared to some of the better systems in this price range. Still, I was sad to see the review unit go—it looked so good on my desk.